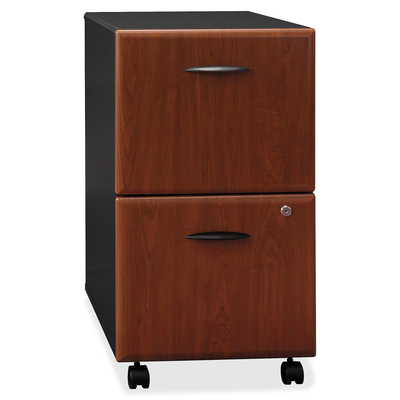 Create More Filing And Storage Space Affordably With This Two-Drawer Mobile Pedestal Finished In Hansen Cherry For Versatile C-Leg Table Design That Permits Easy Configurations. The Mobile Pedestal Features Two File Drawers On Full-Extension Slides To Keep Files At Your Fingertips. It Rolls Conveniently Under Bush Business Furniture Series A Desk Surfaces To Minimize Your Office Footprint Or Moves To Where You Need It Most. This Component Offers A Locking File Drawer And Accommodates Letter-Size, Legal-Size Or A4-Size Files. It Is Constructed With 100 Percent Thermally Fused Laminate For Durability And Superior Resistance To Scratches And Stains.. Create More Filing And Storage Space Affordably With This Two-Drawer Mobile Pedestal Finished In Hansen Cherry For Versatile C-Leg Table Design That Permits Easy Configurations. The Mobile Pedestal Features Two File Drawers On Full-Extension Slides To Keep Files At Your Fingertips. It Rolls Conveniently Under Bush Business Furniture Series A Desk Surfaces To Minimize Your Office Footprint Or Moves To Where You Need It Most. This Component Offers A Locking File Drawer And Accommodates Letter-Size, Legal-Size Or A4-Size Files. It Is Constructed With 100 Percent Thermally Fused Laminate For Durability And Superior Resistance To Scratches And Stains.